3 years ago I wrote in my annual review about a crazy idea I had in the shower that made my 2014 an amazing year of many new experiences. Well, this year another shower idea (showers seem to be where I do some of my best thinking) came to fruition, but unlike 2014 which had me setting off overseas, this year has been much more about grounding and choosing how I want my life to look now and in the future. But before I get into what happened in the middle of the year, let’s start in January. 2017 started off quite dark for me. I fell in a bit of a heap at the end of 2016 and looking back now I see that I didn’t take the time to do a yearly review which is a shame as we often don’t realise just how much we get done at the year. You see, by the end of 2016 I had taken on way too much and felt completely burned out. It’s possible that taking a few moments to reflect would have changed the course of the following month for me. What happened instead was depression wrapped its tentacles around me and dragged me down into a pit of self loathing and despair. For those of you who have been close to depression, either from going through it yourself or being near to someone who has, you’ll know how soul-crushing, frustrating and dangerous it is. It took me over a month of numb days, anxious days, black days, despairing days to find my way out of the crippling stage of it and 6 more months to really feel like I could confidently stand on my own two feet again. One of the most important things I did which helped me was talk about it. I had regular visits with my psychologist who was an important non-judgmental ear and was also able to give me some tactics to find hope again. I talked to my incredibly supportive wife, I talked to some close friends who I knew had also faced dark days, I talked to Dale Sidebottom who I was working on a bunch of projects with at the time and I eventually did a Facebook Live on it which was really therapeutic in closing the door on that time and moving forward. It’s not to say I don’t have dark days still now, I believe I will always have them, what’s different is the way I process them. Accepting feelings instead of resisting feelings. Saying OK instead of making it wrong. For such a dark beginning, 2017 shaped up to be an amazing year, all of which I’m looking forward to sharing with you now. These are my personal successes and failures, for the business’ skip down a bit further. We moved from the North East of Melbourne to Phillip Island! It’s been our dream to live in a coastal town for several years so it was awesome to realise last year that everything was in place to finally do it. Thank you to all of you for supporting this business by buying things, sharing things and even just being a part of the amazing community. Part of what we wanted from moving to a small town was have a sense of more community. Working for yourself is quite isolating, especially working from home, so I love being able to just leave the house and run into people I know. A friend also recommended joining the local volunteer fire brigade as a way to get involved with the community to which the inner-child in me said YES! It’s been a fantastic group of people to know, it’s 100% volunteer, these people give up a lot of their free time to help keep their community safe. A few have been doing it for 50+ years. Plus the training has been a great way to build my own confidence and self-esteem. This year I got back into Yoga which I hadn’t done for a few years by signing up to a 40 Day Yoga Challenge at a local studio. It was certainly challenging but has left me with a short daily morning practice which I’ve found to be a life saver. I often wake up sore and achy and I suffer from crazy tight hips like most men. Doing 10-30 minutes of yoga in the morning alleviates that and helps me start my day feeling great. As I had my 30th birthday in December I also realised that ‘hey, time is passing’. I do feel a little bit wiser and a little bit older and a little bit more hairy than at 20, but I’m sure at 40 I’ll look back and think about how much more I had to learn. This decade will bring new challenges (hopefully some of which will be in the form of tiny humans) and new moments of joy. I’m looking forward to it! I’ve said it before and I’ll say it again, moving is hard! This move made me realise how much the things around me ground me. The cafe’s I go to, the people I see, the places I shop, the streets I know, the parks I walk to, etc. Moving 2 hours from all of that left me feeling untethered which was very disconcerting but it was also a chance to find a way to feel more grounded within myself. It was a good 3 months before that started happening and now at nearly 7 months since I moved I’m feeling much more settled. The lesson here has been to be patient with myself and to let things unfold. How hard is it to make new friends as an adult? I’m not talking about acquaintances, the people you say hey to and have some quick small talk, I’m talking about the people who get you, who you get excited about seeing even if you just saw them yesterday. I learned this after moving overseas a few years ago but had to relearn this after moving to a new town. People are very friendly down here which can make it hard to tell if they are interested in just being people who say hello or if want to come over for a BBQ. Also I’ve found that when it comes to making friends most people are scared too, we’ve all be burnt by friendships in the past and that can lead us to be wary of new people. My big lesson here has been to be proactive, be the person that does invite someone over for dinner or out for a hike. Then let go of the outcome, I’m a bit of an odd guy (you should hear me trying to explain what I do for work) so not every person I meet will become a friend. That’s OK as there is someone new just around the corner. (And I’m happy to say we have made some lovely friends down here). Now let’s get into the business successes and failures. One of the things I did as I came out of my depression earlier in the year was to spend some time getting really clear about what I wanted my life and work to look like. Part of getting burned out was due to doing what I that I should be doing instead of doing what I would like to be doing. What I realised for Bootcamp Ideas is that I wanted to get back to the roots of how the blog and community started. To me that means creating ways for the community to share with each other, to create ways for knowledge and expertise to be shared so that we can all be better trainers. It took the pressure off me because I realised that I don’t need to be the expert, there are plenty of experts in our community, my job is to give them a platform. One community focused thing I brought back was our Annual Bootcamp Ideas Competition. This is a great way to give talented trainers a place to shine and also promote some great products in the prize pool. We used our Facebook group for people to send in entries and I had a lot of fun coming up with award names and choosing the winners. I’m looking forward to running this again (bigger and better!). I brought back 31 Days to a Better Fitness Business, a course I ran twice a year helping trainers build a solid foundation on their business to grow from. It was fantastic to run the group through and also to see that although the course was written several years ago, it still works. It also became part of a bigger collection of courses called Bootcamp School. 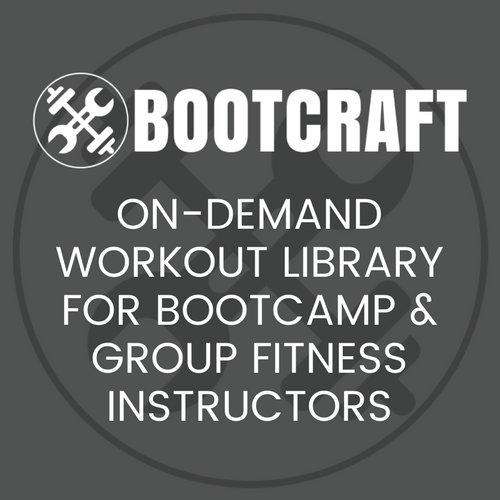 BootCraft’s subscribers grew by another 150 trainers this year and we added another 159 workout ideas to the library (total number of drills is currently 438). Over 2000 trainers have now used BootCraft to help plan their workouts. It keeps growing with very little marketing which tells me that a) the right people are finding it and b) it’s what they’re looking for. This year was my first year at FILEX, a conference for trainers that runs here in Australia. I actually won the ticket thanks to FITREC and everything else fell into place. It was a good experience seeing what’s considered to be the biggest industry conference here and I got to meet a bunch of readers but I found it a bit lacking with content for bootcamp-style group fitness trainers like us. It also felt too big, too spread out, too impersonal which I think had something to do with a new venue. One thing that’s always a challenge in business is juggling short term results and long term results. After scrambling in 2016 to get Bootcamp Ideas profitable, this year I had stop and make the change back to focusing on long term results. Those are activities like building up and interacting with the community and getting clear about what my business is about. I keep talking about a retreat for us trainers and it keeps not getting past the planning stage. We have scoped out some venues and played with dates and format but I keep changing the size of it. I want to keep it affordable while maintaining a certain level of quality which is challenging. It’s also a huge task organising on top of what I’m already doing and the business isn’t quite at the stage financially where I can hire someone to focus on just that. I’m confident it will happen, it just might take a few years. Here are the most popular workouts posted on Bootcamp Ideas this year. It doesn’t mean they’re the best necessarily, it just means they were viewed the most. I think it is so cool that not one of those workouts was written by me but instead where sent in by trainers located all around the world. It’s proof that as this community gets better, we all individually get better. Bootcamp School: I’ll be reopening the doors on Bootcamp School early in the year to help a group of trainers give their businesses a boost in 2018. Competition: The annual competition will also be back. I’m already working on the prize pool which I’m hoping to be pretty amazing. I’d also love to have a bunch of different categories too. Updating Starting a Bootcamp Business: I wrote the Starting a Bootcamp Business book back in 2014. While it’s all full still rock solid advice, a few of the tools I recommend have changed and some techniques have been refined so I’ll be updating it and adding a course version for those that want to break it down into actionable tasks. New Podcast Season: Over on The Trainers Tribe, Dale and I are working on the next season which is all about how to start creating some passive income in your business. It’s how to do something once that keeps earning you money with minimal extra work. Enjoyed reading my yearly review? I highly recommend doing your own, it’s a great way to reflect on just how much you’ve accomplished and focus on next year. I guarantee you will be amazed at just how big this year has been for you and how fare you’ve come. Thank you, Kyle for your Year in Review. You’re one of the more thoughtful trainers who’s sharing training & business tips. I purchased one of your bootcamp packages, & it’s been quite useful. More than anything, I’d like to thank you for sharing how you’ve been managing depression. I’ve had family members with it, & dealt with a relatively mild case myself. Perhaps your example will encourage others to seek help.